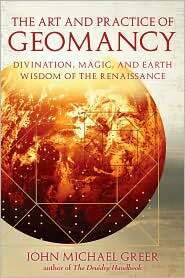 The Art and Practice of Geomancy is a practical down to earth guide outlining the study and practice of the ancient art of geomancy. The book is conversational, easy to understand, fun to read, and the instructions on how to cast geomantic divinations are simple and straight forward. This book is written in a style that makes it seem as if the author is in the room with you, sitting with you and explaining the history, the concepts and theories behind geomantic practice. The book is divided into three parts: the first part contains chapters that introduce the reader to the history and art of geomancy. The second part deals with the actual mechanics of how to decipher the symbols and how to cast a chart. The third part works with meditation and magic using geomantic techniques. Chapter one contains a fascinating account of the history of geomancy, its origins, how it spread, and how prevalent it was during the middle ages. The author doesn’t bog down into to boring details, but instead engages the reader with a series of stories as well as facts to back it up in an interesting and entertaining manner. Chapter two is a basic outline on the practice of geomancy. It discusses the “anatomy” of each symbol, how the symbols relate to other esoteric disciplines such as alchemy and astrology and how they interrelate to these different disciplines. Chapter 3 provides information on the 16 geomantic characters and their meanings. Chapter four instructs the reader in how to cast and divine a chart. This chapter is packed full of information, discussing ethical standards when asking questions and divining answers, discusses timing, conditions for a favorable reading, contemplations and chart casting. Chapter five explains how to cast and read a shield chart, and chapter six explains how to cast a house chart. Chapter seven introduces the reader to more advanced geomantic techniques, such as doing life readings, locating missing objects, or persons, how to cast multiple or third party readings, and explains how to do life readings. Chapter eight involves the art of geomantic scrying and meditation. The author provides easy to understand instructions on both topics as well as exercises and meditation techniques. Chapter nine discusses the principles of geomantic magic. Here the author provides a basic outline on magic based on and practiced during the Renaissance Era. Greer explains the difference between a talisman and a gamahe. The rest of the chapter is composed of a mini spell book that details the types of materials a geomantic magician can use, such as wax, paper, or metals. He provides examples of sigils and provides a brief outline on timing. Chapter ten involves geomantic ritual magic, which involves setting up altars, preparing for the ritual, what type of ritual you want to use, how to contact various spirits, etc. There are charts that are useful in contacting divine or angelic forces to aid the practitioner in his or her work. There is also a guide for disposing of talisman and gamahes. This is a thorough and easy to understand guide for learning and practicing the art of geomancy. It’s very well put together, thought provoking and interesting. Most of all, it’s well worth the price. I hope you enjoy it as much as I did.